This is my last expenditure tracker post for the 2012 calendar year and in addition to doing the monthly tracker it will give me a chance to assess how I went for the whole calendar year versus my goals at the start of the year as well as my reset goals in the middle of the year. There were no particularly big impacts on my expenditure goals for December 2012. This was largely due to the fact that I was travelling for much of the month and my only real investments were in my automatic employee share plan and reinvestment of dividends. The rest of my savings went to my home loan offset account as I had found no real compelling reasons to either buy or sell stock at the prices at the time. I spent quite a lot of money on my credit card in November 2012 compared with the previous month and I had to pay this off in December. This was offset by a reduction in cash related expenditures. Although it may seem strange that I achieved all of my savings goals for the year while at the same time really spending much more than I was hoping to spend, this is due to the fact that I received a bonus which I don't account for when making my expenditure and savings goals. I am happy that I far exceeded what I had originally planned to do on the savings and investing front at the start of the year although I really do need to control how much I spend. I spent over $40,000 in after tax dollars living at home in what should be quite a low expenditure environment. Going forward I am going to try and control this some more. Since re-setting my expenditure goals to what I think are more achievable and normal expectations I have done much better. Not all of this was because I increased the amount I was willing to spend on personal expenditure but I have actively been spending less per month. Once again the significant out performance of my savings and expenditure goals was due to the bonus that was paid in the second half of the year. As I pointed out in my 2013 Financial Goals post, I was away for the last past of 2012 and the first part of 2013 with no access to the Internet (for all considering going to India - wi-fi access is NOT freely available). As a result I am rather delayed in my December 2012 net worth post. The date at which it is accurate is also not 31 December 2012 but rather 14 January 2013 because this was the first day I was able to get accurate data. 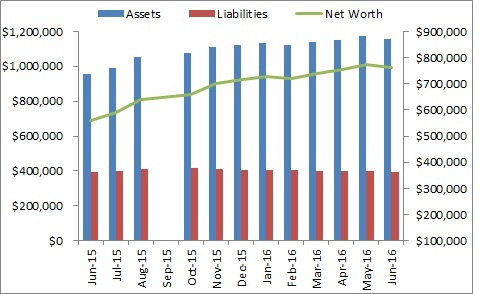 My net worth performance for December 2012 was actually very pleasing because, although it does not account for all of my expenditure on my overseas trip, it includes a large portion of it. The surprising fact is that, because I took a vaccination in a country where goods and services and living are so much cheaper than Australia, the amount I spent on the trip was not vastly dissimilar to the amount I would have spent partying / going out and generally living life at home. In my November 2012 net worth forecast I had actually forecast a decrease in my net worth due to the holiday, Christmas presents and the purchase of my sports car. If I had purchased my sports car I think I would have had close to a flat performance however I delayed this purchase while I travelled. As outlined in my 2013 financial goals - I am no longer sure if I want to purchase that car or put the money towards moving out of home. Strong share market returns: The share market has started extremely strongly in 2013 and this is driving much of my net worth gains. My goal for January 2013 is to get my net worth above $336,000. I know this is a rather small increase but for this first month I am not aiming too high. A belated Happy New Year to all of my readers. My apologies for being absent for a significant period of time. I spent several weeks travelling through India on holiday. I had planned on doing a series of posts from there however discovered that it was near impossible to get a sim card as a tourist and the wireless access was terrible. Currently I still live at home however want to move out this year. I do not know whether I will rent or buy. Having said that, I have always believed that goals should be flexible and should be subject to change. These goals are based on the assumption that my life situation does not change and so will almost certainly change over the year. I have spent a lot of money over the last month (and predict this will continue into the current month) to update my wardrobe. While I will expand on this later the long and short of it is that I hate shopping and so don't do it very often. The result was that when I looked at what I was actually happy to wear outside the home there was not a lot. Because I want the greatest possible flexibility when it comes to my living arrangements (see above) I am dedicating more funds this year to to home loan relative to my stock investments. Last year it was the other way around as I felt I was very over-weight property and needed to increase my stock holdings. A skiing holiday (potentially overseas but potentially locally as well) - I don't know how to ski which means I really shouldn't be too fussy. As with last year the costs of these items should be covered by my annual bonus. Unfortunately for me this bonus is paid at the end of the year and a significant portion of it is deferred compensation. Have you set your financial goals for the year? What are they? How much did you think about them and do you track them?